Here is a poster to share with your child. Click on the image to view it on your screen. Use child-resistant containers if there are children in your home -- even if only as visitors. Do not transfer your medication to a container that is not child-resistant. Child-resistant containers are not child-proof. Even when in a child-resistant container, it is important to store medication away from young children. Over-the-counter medications -- not just prescription medications -- pose a safety hazard to young children if ingested. For example, vitamins with iron can be toxic to children if taken in large quantities. 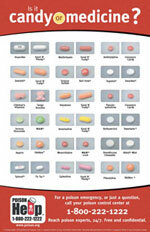 Use child-resistant locks on high cabinets where medications are stored. Do not give medicine prescribed for one child to another child. Do not give cold or cough medicine to a child under the age of 2 years. Many different cold and cough remedies have the same active ingredients in common. This means that you could accidentally be giving your child an excess dose of one or more medications if you give your child multiple cold or cough medications. Check with your health care provider or pharmacist if you are able to safely give more than one cold or cough medication. Do not use your regular kitchen spoons to measure medication. Only use a medicine cup, syringe, or spoon that is designed for measuring of accurate doses. Do not discard medication into an open waste basket in the kitchen or bathroom since many adult medications can be toxic to a young child or pet. Do not take medication in front of children since they like to imitate grown-ups and may take them later on. Accidental ingestion of medication is especially common with visits to the home of grandparents. Grandparents are more likely to have many prescription medications in the home and these may not be stored out of reach or in child-resistant containers. Make sure this loving home environment is also a safe environment for young children to visit. 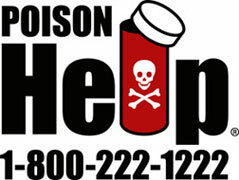 If you have concerns about an accidental medication over-dose or poisoning, call the nation-wide toll-free number for a poison control center: 800-222-1222.